I have been on a mission to make FMD sourdough bread for a while now. I started my starter, but I ran out of sprouted wheat flour. I got more flour, then had the starter in too warm of a spot so it molded. Then I tried again and forgot about it, because, life. Again, it molded. So I tried yet AGAIN, with a promise to myself that I would be diligent and mindful, because I want this to work! The starter takes about 7-14 days to be ready, but longer is better. You do need to be diligent. Set a calendar reminder on your phone. 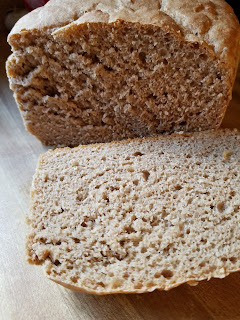 Sprouted wheat flour is more finicky than white flour. White flour will wait a few days for you to pay attention to it, whereas sprouted wheat demands your attention and love and care much more frequently. It is fickle and will turn bad on you the moment it thinks you have abandoned it. But love it, name it, talk to it. Nurture it. And it will love you back. You can search the internet for starters and how to do them. You will find many posts about precise measurements, or weights and exact timing (as in the all the times are listed as a schedule) but I am not that type of baker. If I had my dream job of a boulangerie in Paris, making croissants, and pastries, I would be that precise. Alas, I am a home baker in middle TN and I am more loose and free. 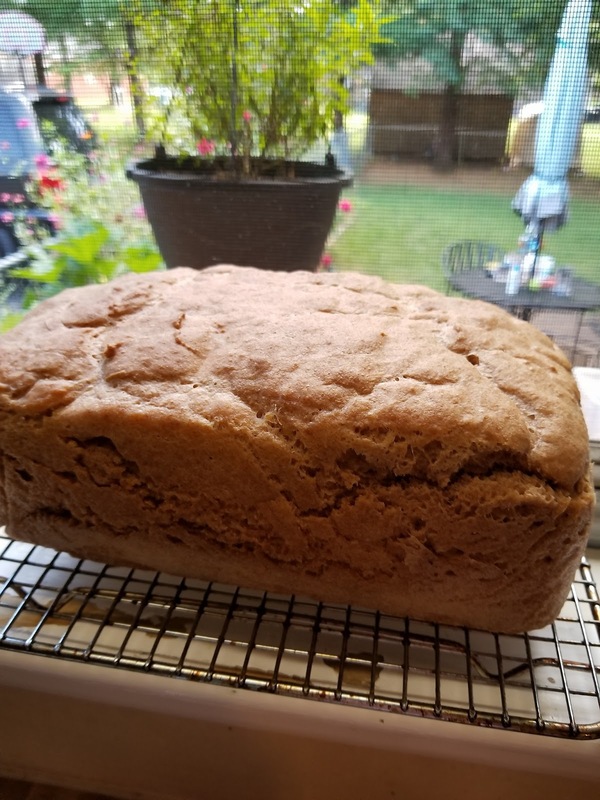 This bread is not a traditional sourdough bread because I use a bit of yeast and the egg whites. Sprouted Wheat Flour is tricky to work with sometimes. This bread has a nice tang to it. It is super moist, stays fresh longer, and the flavor gets stronger as time goes on. And it is easy to make- once your starter is ready. While you can use my flour mixes to make the bread, the starter needs to be made with sprouted wheat flour. I have not tried any gluten free flours to make starter. I did attempt to use my mix to make the starter, and it molded very quickly. do not cover tightly. You are capturing wild yeast so you need some air flow. Once your starter is ready, you can keep it in the fridge and feed it less often- every few days. You can also dry a starter- spread on silicone mat and let dry. Break into flakes, store in airtight container. When you are ready to bake, a couple of days in advance, add some water, fresh flour, and feed it a couple of times a day until baking day. Put into jar, stir well. Cover with cloth or filter and hold it down with metal ring or rubber band. Place jar on top of fridge. Stir the starter. Add 2T flour, and 2T water. Stir, cover. put it on top of fridge. If the jar starts to get crusty, transfer to clean jar. If the starter starts to smell sour, you are good to go ahead. If not, continue to feed daily as above. On these days, you want the jar about half full of starter- discard what you don't need (or start another starter for a friend). In the morning, you will add only flour. Add enough flour to make a loose dough in the jar. Cover and keep warm on top of fridge. In the evening, feed again with only flour. In the morning you can bake. You should notice the starter getting bubbles in it, and maybe swelling. This is good. It is ready to bake with. When you are done baking, if you have left over starter, feed it, put in fridge. Every 2-4 days, feed it again with equal parts of water and flour. If you are not going to bake with it for a while, use about 1T of flour and water to feed. When you are ready to bake, pull it out, put on top of fridge a couple of days before baking day. Day before, feed it in the morning, adding only flour. Feed it again before bed with only flour. Next day it should be ready to go. If you are going to bake regularly, feed it every day with 2T flour and 2T water and keep on fridge. Add 1 1/2 cups of starter to the water and yeast. Add 1/2 cup additional flour to the amount in the recipe. Stir, pour, rise and bake as instructed in the recipe. Since my husband is a home brewer, would my starter be ready faster due to all the yeast floating around the house? He uses some pretty hearty strains when brewing. It is very possible. You may want to keep an extra eye on your starter. Thank you for fixing my goof. What I was trying to ask is I see "Add 1 1/2 cups of starter to the water and yeast" but I do not see water in the recipe. Is that intentional? I am really wanting to try this recipe. Thanks for taking the time to figure it out. There is water in the bread recipe that's linked and in the starter recipe, so which recipe are you not seeing water? I want to make a gluten free sourdough and I have been making my starter with brown rice flour. Can I still use your recipe and for the sprouted wheat flour use your recipe for gluten free flour mix? Where do you buy or what brand of sprouted wheat flour do you use? my husband LOVES sourdough! Looking forward to trying this!